When I was researching leaf-mining moths for Tracks & Sign of Insects, I kept coming across the name Braun, an author of comprehensive works on various groups of Microlepidoptera: “Revision of the North American Species of the Genus Lithocolletis Hübner” (1908); “Nepticulidae of North America” (1917); portions of Forbes’ The Lepidoptera of New York and Neighboring States (1923)… and then there was “Tischeriidae of America North of Mexico (Microlepidoptera)”, published in 1972. Could this last one possibly have been by the same person as the first three, published decades earlier? Sure enough, they were all the work of Annette Frances Braun (Aug. 28, 1884 – Nov. 27, 1978). 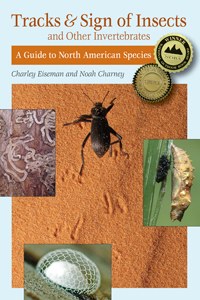 She published at least a couple of other major works in between, which I had not seen yet when I wrote my book: “Elachistidae of North America (Microlepidoptera)” (1948) and “The genus Bucculatrix in America north of Mexico (Microlepidoptera)” (1963). Since today is her birthday, I thought I’d dedicate a post to this amazing woman who studied tiny moths for well over 60 years. Information about Annette F. Braun online is scarce–there isn’t even a Wikipedia entry for her, and for a while all I could find was this picture of her grave in Cincinnati, the city where she was born and lived her whole life. In 1911 she became the first woman to receive a Ph.D. from the University of Cincinnati. She lived with her sister, botanist Emma Lucy Braun (1889-1971), with whom she shared an experimental garden. They traveled together, making extensive surveys of Appalachian forests from Kentucky to Vermont. According to her obituary, Annette was deeply involved in the efforts to preserve outstanding natural areas in Adams County, Ohio. When she died, her collection of about 30,000 Microlepidoptera specimens was given to the Philadelphia Academy of Science. Larval case of a pistol casebearer, photographed in Adams County, Ohio. Although there are a few very similar species, this is most likely Coleophora atromarginata, described by Annette Braun in 1914. By my count, Annette F. Braun described and named 341 North American moth species, which is more than 1 in 40 of all the species that have been described so far. In addition, there are several species that were presumably named after her: Sigela brauneata (Swett, 1913); Ancylis brauni (Heinrich, 1931); Chionodes braunella (Keifer, 1931); Stigmella braunella (Jones, 1933); Acleris braunana (McDunnough, 1934); Crambus braunellus Klots, 1940; and Glyphipterix brauni Heppner, 1985. (Parentheses around author citations indicate that the species was placed in a different genus when first described.) Then there is the elachistid genus Annettenia Traugott-Olsen, 1995, created for the species that Braun had named Onceroptila eremonoma. I imagine Argyresthia annettella Busck, 1907* and Phaneta annetteana (Kearfott, 1907)** were named for her too; though she was only 23, she must have already been well known to other microlepidopterists, since she would have been finishing up her Lithocolletis revision at that point. 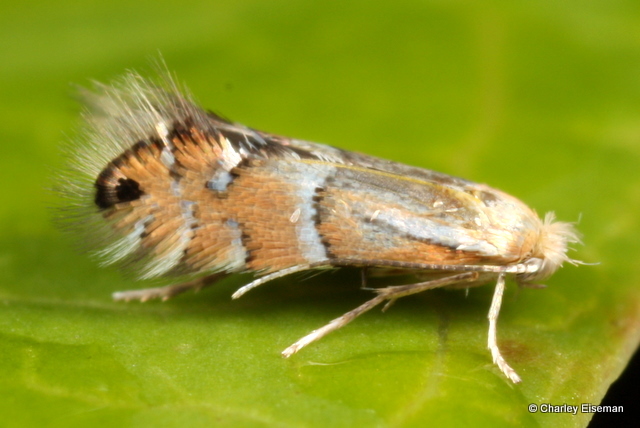 Phyllonorycter martiella, a miner in black birch leaves, described by Annette Braun in 1908. 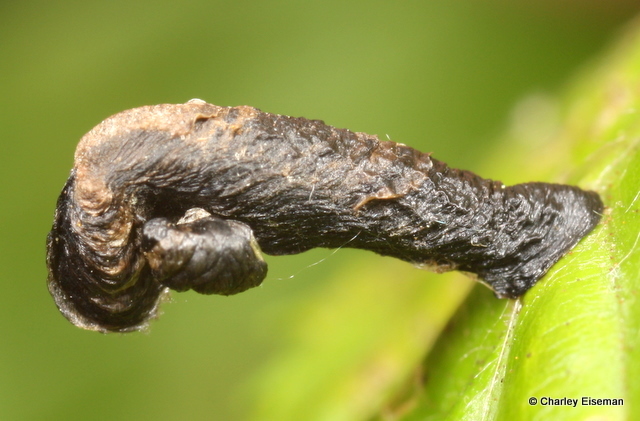 The underside tentiform mine from which the above moth emerged. It’s certainly humbling to contemplate the life of someone who accomplished so much at such a young age, and then kept at it for another 60+ years–and all without the aid of computers, digital cameras, and other tools that have been so prominent in my own naturalist education. Busck, A. 1907. 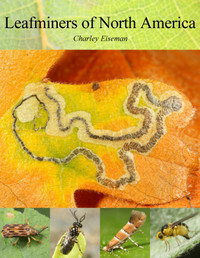 Revision of the American moths of the genus Argyresthia. Proceedings of the United States National Museum 32: 5-24. ** (Added 12/30/2015) Yes, William Kearfott ends his description of Thiodia annetteana with this note: “Seven specimens : Cincinnati, Ohio, April 2d to 23d, all collected by Miss Annette F. Braun, whose name will fittingly honor this dainty species.” In the same paper he described Archips brauniana from specimens she had collected, but this is now considered a synonym of Archips grisea (Robinson, 1869). Kearfott, W. D. 1907. New North American Tortricidae. Transactions of the American Entomological Society 33(1):1-97. 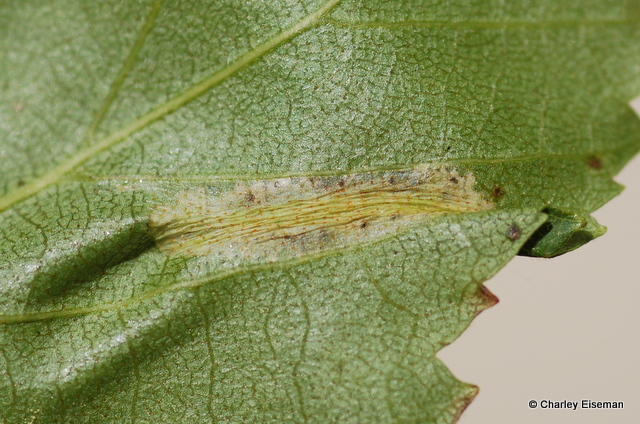 This entry was posted in Uncategorized and tagged Annette F. Braun, Betula, Betula lenta, birch, black birch, casebearer, Coleophora, Coleophora atromarginata, Gracillariidae, leaf mine, moth, Phyllonorycter, Phyllonorycter martiella, pistol casebearer. Bookmark the permalink. Nice account, Charley! As a plant ecologist, I have long been familar with the writings o E. Lucy Braun and had heard incidently that she lived with her sister, but I knew nothing about that sister. How interesting to learn that she was also an accomplished naturalist! What an interesting account! There are so many women who are mostly forgotten, who were amazing scientists. Thank you for introducing me to another one.